PRP – magic bullet, or damp squib? 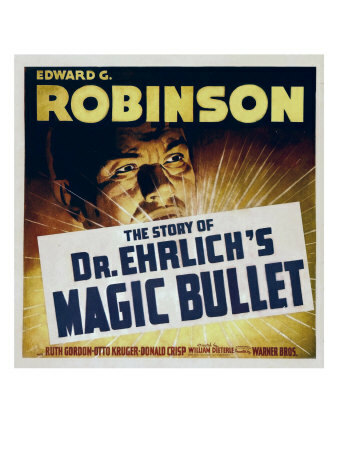 I’m guessing that not many of you will have seen the Academy Award-nominated biographical movie ‘Dr Ehrlich’s Magic Bullet’ starring Edward G Robinson. It outlines part of the career of the famous German scientist Dr Paul Ehrlich, who popularised the concept of the ‘magic bullet’ therapy for the treatment of specific diseases. The film focuses on arsphenamine, ‘compound 606,’ and Ehrlich’s cure for syphylis. The concept of the ‘magic bullet’ is rather older however, dating back at least to the 1800’s and deriving from the histochemical staining of tissues. It was Ehrlich’s opinion that, if a chemical could be found that targeted a pathogen, then a toxin could be delivered along with that chemical and hence a ‘magic bullet’ would be created that would destroy the pathogen leading to the elimination of a disease state. The concept was later realised following the discovery of monoclonal antibodies for which Köhler, Milstein and Jerne shared a Nobel Prize in 1984. So-called ‘targeted therapies’ do not necessarily destroy their target as such, but may act to cause some form of modification, for example to a cell membrane via second messenger cascades or within the cell nucleus itself, leading to alterations in cellular genetic expression which then lead to a sequence of events that ultimately results in healing or an improvement in clinical symptoms. Platelet-rich plasma (PRP) has been perhaps the most widely investigated preparation of late. PRP contains a number of growth factors including PDGF, IL-8, and CTGF, which have a number of different effects on different cells. Many of these actions are poorly understood, despite much basic science research, yet this has not prevented the clinical application of PRP for tendinopathies which is perhaps not surprising given the search for effective therapies for tendinopathies and the drive for ‘cutting-edge’ therapies in Sports Medicine. However, when one stops to consider the knowledge gaps we have concerning the pathophysiology of tendinopathies, and our lack of understanding of the complex interactions involved in cellular healing mechanisms, then perhaps one may not be surprised to see the heterogeneity of results from clinical trials using PRP in the treatment of these conditions. The three main theories for the genesis of tendinopathy, namely overuse, overload and thermal stress, are still open to debate and there is a very wide range of possible actions of PRP on tendinopathic tendons. Well-conducted clinical trials such as this one by de Jong et al on PRP for achilles tendinopathy, and systematic reviews such as this one by de Vos and colleagues ,have failed to find a positive clinical effect when using PRP use for the treatment of tendinopathies. In this month’s systematic review in CJSM on the use of PRP in Sports Medicine as a new treatment for tendon and ligament injuries, Taylor and colleagues concluded that, despite several possible theoretical advantages to the use of PRP, there are very few well-conducted prospective studies and clinical trials available with which to inform clinical practice. The recent IOC consensus paper on the use of PRP in sports medicine published in BJSM also highlighted the limited amount of basic science research, the paucity of well-conducted clinical studies on PRP, and the heterogeneity of methodological issues between different studies making comparisons of clinical effects difficult to judge. The IOC group’s recommendation was that clinicans should proceed with caution in the clinical use of PRP. The debate is on as to whether there is a true lack of efficacy of PRP in the treatment of tendinopathies, or whether we simply need more well-designed clinical research. What do you think? Where do we need to focus our research efforts? Should we forget the idea of ‘targeted therapies’ such as PRP and ‘magic bullets’ for tendinopathies? 2 Responses to PRP – magic bullet, or damp squib? Just want to say your article is as surprising. The clearness on your put up is just excellent and that i could think you are an expert on this subject.